Located in one of New York City's most exclusive and prestigious neighborhoods, AKA Sutton Place offers luxury apartments and serviced residences, providing a quiet respite from the bustle of midtown Manhattan. First opened in 1929 and known as the Sutton Hotel, this elegant pre-war building has provided a refuge for literary notables, Europe-bound World War II soldiers, and young adults hoping to make it in the big city. Now known as AKA Sutton Place, the 76 beautifully-designed apartments have been fully renewed with a gracious ambiance that is impressive, yet intimate. 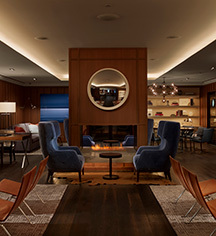 AKA Sutton Place's luxurious one and two bedroom apartments provide the privacy of a comfortably-appointed residence, with select luxury hotel services and amenities, and a gracious staff to attend to every need. Also available is a collection of nine breathtaking Penthouse Suites, located on the top three floors of the building. 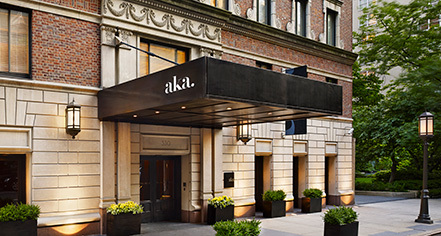 AKA Sutton Place, a member of Historic Hotels Worldwide since 2016, dates back to 1929. Nathanael West, author of Miss Lonelyhearts, was the hotel manager at the Sutton, and at times gave free or reduced rate rooms to his literary friends, including Quentin Reynolds, Lillian Hellman, and Dashiell Hammett. Cancellation Policy:50% of first month's rent, once lease has been signed. Cribs and Pack-in-Plays: Available for rent. Deposit: Full payment for first month's rent due 7 days prior to arrival. Parking: Private parking garage next door. Payment: Credit cards, certified bank check. Pet Policy: Dogs under 30 pounds / $500 non-refundable pet fee. Located in one of New York City's most exclusive and prestigious neighborhoods, AKA Sutton Place offers luxury apartments and serviced residences, providing a quiet respite from the bustle of midtown Manhattan. Learn more about the History of AKA Sutton Place .